Author Written by Velmurugan Saravanavelu and last updated on Posted on May 26, 2017 . Welcome to the tutorial about SAP co-products and by-products. This tutorial is part of our SAP PP course. 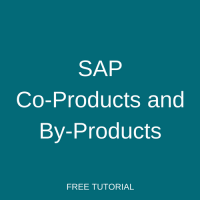 In this tutorial, we are going to learn what are co-products and by-products, what is the difference between them, business examples of co-products and by-products, and SAP settings relevant to them. Co-products are materials which are produced in one production process. That is, more than one final product will come out from a production process. These products will be part of the financial reporting. Any of these products will be considered as “Primary co-product” and all other products will be known as secondary co-products. Production process which gives co-products is called as “Join Production”. By-product is an output from a production process which can be useful/sellable or sometime can be waste. Consider the Foundry Industry which manufactures castings from liquid/molten metal. Castings A and B are molded from the same mold pattern. These are intention products for this process and there are also metal wastes produced from operations like fettling and runner raiser removal process. Here, castings A and B are known as co-products and metal wastes are known as by-products. To have a better understanding of differences between co-products and by-products, let’s compare them in a table. Costing Costing is based on apportionment structure defined in primary co-product. Costing based on net realizable value. BOM Settings Co-products have negative sign along with co-product indicator in BOM. By-products have only negative sign. Financial Report Co-products influences on financial reporting. By-products will not have any influences on financial reporting. 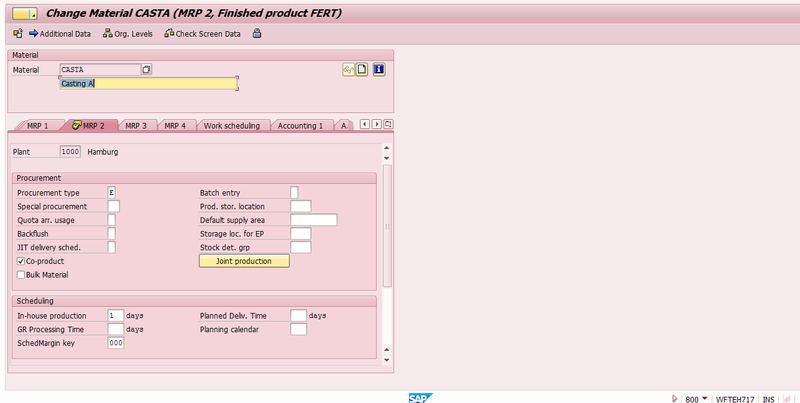 SAP co-products should have a special indicator in their material masters in MRP 2 view. In our example for materials casting A and casting B as shown on the screenshot below. On the other hand, for the by-products this co-product indicator need not to be set. 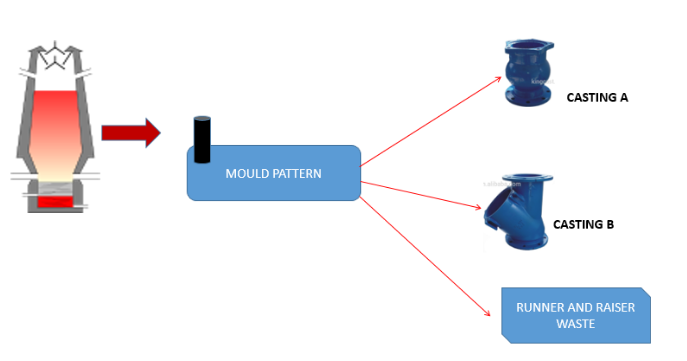 In this example, any one of the castings will be consider as a primary co-product (casting A) and another one is the secondary co-product (casting B) and bill of material (BOM) will be created for the main co-product only. Here, the assumption is that a total of 300 KG of molten metal will be used for casting A (160 KG), casting B (120 KG) and scrap from operations (20 KG). In the bill of materials, both the secondary co-product and the by-product will be maintained with a negative sign. But the secondary co-product will have “Co-product” indicator at the item level of BOM. This indicator is not required for the by-product (called METALSCRAP in our example). Co-products are costed based on apportionment structure defined in the primary co-products. 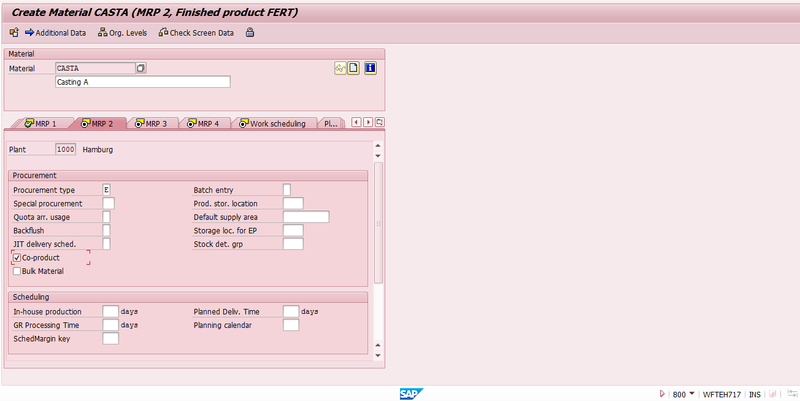 Go to master record of a co-product and click on “Join Production” button located on MRP 2 view. Next, assign a suitable source structure. Then, enter proportion percentages or equivalence numbers for the co-products. Thanks for the additional points added. The Idea about this tutorial is to provide an overview and basic understanding of co-products and By-product at master data level. We will brief about the production order movements in upcoming tutorials. Actually co-products auto GR option was available in earlier ECC EhP6 version itself. We really appreciate and thanks for your valuable comments. Hi, The above document is very nice and helpful. Could you please, provide some document for master recipe in SAP PP-PI. I have small query currently we are doing SAP PP for Sugar Industry. For this Industry Sugar is finished product and Press mud, Bagasse and Molasses are by Products. (2) How we maintained BOM for By products , In Routing each operation wise duration is required or not. (3) For by products GI and GR how it will be done? For GI which movement type and GR which movement type for by products. Thanks for the detailed step. How do you cost the Co-product B # CASTB if you dont maintain BOM & apportionment %? Does all co-product need same setting of main co-product? Yes all co-products in BOM are costed based on apportionment structure maintained for BOM header material (i.e Main co-product ). How is the apportionment method “Quantity based with equivalence numbers” calculated by the system???? thank you for your details about co-product. And i have only one question, for the fixed price about co-product, where can we set the fixed price? In the material master Accounting View 1? Thanks Velmurgan ,well documented . Very good document. Thank you for preparation and explanations.